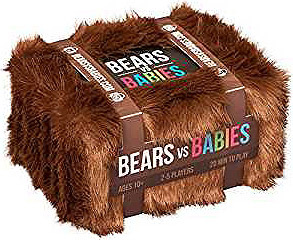 Bears vs Babies is a card game in which you build incredible Bears (and other monsters) to eat awful Babies. Stitch together a Handsome Salmon armed with knives and burritos, or a Pomeranian of Light and Wonder in business attire who can run at the speed of light. Give you creations limbs, weapons, and special hats to help prepare them for the inevitable infant onslaught. In this highly strategic party game, outbuild the Babies and other players to win.